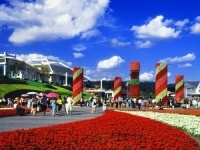 Kunming nicknamed the “City of Spring” and “City of Flowers”, which attracts numerous tourists all year round. The Dian Lake and the Stone Forest are two major attractions of historic interest and scenic beauty. Western Hill offers a great view of Kunming.Yunnan Ethnic Village exhibits the history, the cultures, the customs and the natural village houses of the 26 nationalities living in Yunnanprovince. The Jiuxiang Cave Scenic area is famous for its caves, mountains, rivers, deep valleys, minority customs and cultures.